San Diego has much to offer! Often referred to as America’s Finest City, we are California’s second largest and the eighth largest in the U.S., boasting a population of about 1.3 million in the city limits, and more than 3 million residents countywide. Within its borders of 4,200 sq. miles, San Diego County encompasses 18 incorporated cities and many charming neighborhoods and communities, including downtown’s historic Gaslamp Quarter, Little Italy, Hillcrest, La Mesa, Coronado, Del Mar and La Jolla to name just a few. We have sold more than 500 homes all over this great city and being a native and resident or investor of many communities, we have a unique understanding of the city and neighborhoods that San Diego has to offer and we will help you find your next forever home! Finding your home and managing a move is a complex process. Hear some of our tips. Buying a Home in 2019? Sign up for Michael Cameron’s Monthly Market Minute, your video guide to what’s hot in San Diego real estate. 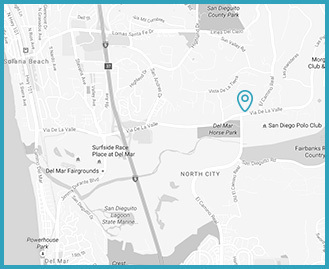 We help clients and their families in the San Diego area, from Del Mar, Solana Beach, Rancho Santa Fe to the 56 Corridor, make their homeownership dreams possible. Current market conditions and the best interests of our clients are always our primary focus while searching for the best San Diego homes for sale. "We recently bought a house with the help of Michael and Amy. We'll definitely recommend using their services. Michael knows the market well, and can estimate the home price pretty accurately. He gave us useful tips that helped us decide the offer price. Because of their commitment and responsiveness, we were able to win twice when competing with other buyers. They are very familiar with the process, making sure the rights of the buyer are preserved, and nothing is slipped away." There are more than 15,000 agents in San Diego, and for the most part the 80/20 rule certainly applies to our profession along with every other profession. The bar to getting a license is set low, and because there are such a large number of us out there, and so many of them aren’t competent, it’s easy to come to the conclusion that real estate agents, in general, are unqualified and overpaid. With 80% of them, I probably wouldn’t disagree. But again, you could make the same assumption with doctors, lawyers, accountants, and any other profession. It’s really no different, but probably more obvious with real estate agents. Although prospective home buyers don’t pay a commission in California, clients hire us for many reasons – to help them find a home, assess proper value, and negotiate on offer on their behalf. Sometimes in a tight market, it’s more about gaining an edge to win a competitive bidding situation. Once buyers have an accepted contract, we help them navigate through home inspections, title, the loan process and seemingly endless state and local disclosures. Buying a home is a litigious process and there are many potential pitfalls which we do our best to help our clients avoid. In most cases, after the home inspections are completed, we again help them negotiate a reasonable repair credit with the seller. As clients come to the end of the escrow process, we help them with their timelines, logistics and planning their physical move, as needed. After escrow closes, we are there for any questions that may come up in the home. Home warranties claims, tax planning, and helping clients determine the feasibility of a home expansion, are all examples of assistance we are able to provide long after the sale is done. If sensitive timelines and processes are neglected, home buyers can be exposed to a number of problems and potential liabilities. These are just a few of the ways we help home buyers, and we take all of these aspects of the process seriously, from the beginning to as long as you own your home. I’ve been in the real estate and investment business for more than 25 years, and I’ve called many areas of San Diego County my home for nearly 40 years. Clients hire us for a lot of reasons, but most importantly people hire us because we care about the experience and results you have when buying a home. We listen compassionately and provide advice, solutions, and practical steps in service to what you and your family are looking to accomplish. READY TO BUY OR HAVE QUESTIONS FOR CAMERON? Whether you are a first time buyer, seller or experienced investor of distressed properties in San Diego county, CRES is here to provide experience, knowledge, integrity and professionalism. Current market conditions and the best interests of our clients are always our primary focus. From simply providing the floorplans of local developments to negotiating the purchase or sale of your home, you are the highest priority to our agents because they understand that purchasing San Diego Real Estate is one of the most important decisions you can ever make. CRES specializes in handling luxury home sales and distressed sales (Short Sales) in all areas throughout San Diego County.